Fluoride is being added to drinking water in a number of locations around the world, and in recent months there have been efforts to extend fluoridation of our drinking water, notably in Ireland, the UK, Australia, New Zealand and California. Although benefits from fluoridated water are certainly not a scientific certainty, there is quite some data on dental fluorosis, brittling of teeth by the action of fluoride, which is generally put down to being a mere "cosmetic problem". Fluoride has also been found by major epidemiological studies to cause skeletal fluorosis, causing an increase in the rate of hip fractures. Dr. Gerard F. Judd, a retired chemistry professor from Purdue University has been warning against the use of fluoride, and he backs up his warning with research and data, as well as an understanding of chemical reactions. His proposals on how to take care of our teeth without the use of fluoride are listed in a comment that was posted on a previous post of mine titled: Fluoride - No Thank You! Thanks to Patricia, who took the trouble of commenting on that article. I think her post is important enough to distribute further. I would also like to ask you, the readers, to share your own experiences. Dr. Judd's research is very impressive. I actually healed myself from harm caused by the dentists using his book. Please read some of the results of his research below, including the dangers of fluoride. The book offers more information on root canals, mercury, etc. Please consider the book for you store. Letter from Dr. Gerard F. Judd, Ph.D., Chemist, Researcher for 18 years, Professor of Chemistry for 33 yrs. We can all stop spending billions for American dental work and research. Let me tell you why: I have learned the real causes of dental cavities and gum infection. People, including you, will now be able to take care of their own dentistry with insignificant cost, and end with perfect teeth. Cavities and gum infections are ended! 1. Tooth cavities will be ended simply by rinsing acids off the teeth. ACIDS ALONE EAT THE ENAMEL. THERE WOULD BE NO CAVITIES IN THE WORLD if all people rinsed acids from their teeth promptly. Just sip water, milk or other liquid while eating. Water reacts with acids. 2. Foods and drinks, other than those containing acids, have no action on tooth enamel. SUGARS HAVE NO ACTION ON THE ENAMEL. 3. Bacteria cannot damage the enamel (calcium hydroxy phosphate). There is no such thing as decay of the enamel since bacteria require carbon and hydrogen to live. 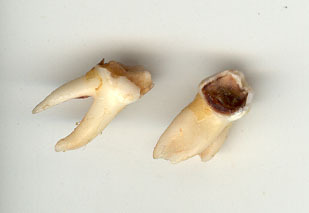 Billions of human and animal remains show teeth and bones are resistant to earth-bound organisms. 4. Teeth reenamalize when clean. TO MAKE TEETH CLEAN ONE BRUSHES WITH ANY BAR SOAP. Soap washes off in just 2 rinses. What about toothpastes? Glycerine in all tooth pastes is so sticky that it takes 27 washes to get it off. Teeth brushed with any toothpaste are coated with a film and CANNOT PROPERLY REENAMELIZE. 5. Taking calcium and phosphate in the diet results in reenamelization of the teeth, but only when they are clean. Bar soap does a perfect job in cleaning the surface. The enamel thickens and becomes less sensitive. Adenosine diphosphatase furnishes phosphate to teeth. 6. Gums are disinfected by brushing with any bar soap. Not only bacteria and viruses are destroyed promptly by small amounts of soap in water, but also white flies and aphids. Gardeners: Spray 1 tsp of dishwashing soap in 1 gallon of water to kill white flies and aphids. 7. Plaque, a poorly formed crystal stuck to the bottom of the enamel, is prevented and eventually removed by brushing with bar soap. Dental procedures to get the badly formed crystals off dig holes through the enamel. These cavities catch food and cause gum infection. 8. Prevention of plaque retards gum pockets. GUM POCKETS are formed as the plaque pushes the gums away from the teeth. GUM POCKETS, from 1 to 8 mm deep, ARE ALSO FORMED BY FLUORIDE, WHICH SEVERS THE PROTEIN MOLECULES ADHERING THE GUMS TO THE TEETH. SOAP PREVENTS GINGIVITIS caused by bacteria which is lodged in the gum pockets. 9. VITAMIN C AND PHOSPHATE help knit the gums back to the teeth. Pressing against the gums with fingers forces adhesive materials from the gums onto the teeth, which helps the process. Abscesses can be offset by holding Cepacol (14% alcohol) in the mouth 5 minutes. 10. 'Receding gum' surgery will end when the GUM POCKETS cease. The very mention of the procedure, which involves transferring flesh from the roof of the mouth to the excised area of the gums, is a heinous and useless procedure which ought to pass into oblivion. 11. REMOVAL OF FLUORIDE FROM DRINKING WATER, PASTES OR GELS SAVES THE ENZYME ADENOSINE DIPHOSPHATASE so it can deliver phosphate to calcium at the tooth surface, RESULTING IN A BEAUTIFUL, SEMI-FLEXIBLE ENAMEL. 12. As stated above, THE GUMS CAN BE RECONNECTED TO THE TEETH BY TAKING VITAMIN C (ASCORBIC ACID) (1 tsp) with Arm and Hammer baking soda (1/2 tsp) in 1 inch of water, letting it fizz and then diluting to 1/2 to 1 cup with water, then drinking. The resulting SODIUM ASCORBATE is non-acid, very pure and a thousand times more soluble than vitamin C. SODIUM ASCORBATE IS MORE REACTIVE THAN ASCORBIC ACID (C) in building connective tissue and antibody structures and more effective in killing some viruses and bacteria. 13. Receding gums and plaque are ended when soap is used for brushing and VITAMIN C IS TAKEN DAILY AS DESCRIBED IN #12. 14. 30% of American youths ages 8-10 have no cavities. 100% of Ugandan youths ages 6-10 have no cavities. What does this tell us? 15. THE REASON UGANDAN YOUTHS HAVE 3 TIMES BETTER TEETH THAN AMERICAN YOUTHS IS BECAUSE they do not consume as many acid foods, have no fluoride in their drinking water, have regular meals rather than sipping acid drinks all day, have more calcium and phosphate in their diet, and have fewer dentists to 'WORK ON' their teeth. 16. DENTAL LITERATURE says 42% OF AMERICANS OVER 65 HAVE NO NATURAL TEETH while 25% OF THOSE OVER 43 HAVE NONE. 17. Dental literature says AMERICANS AGE 43 AVERAGE 32 CAVITIES, those AGE 17 HAVE 13 CAVITIES, blacks and poverty stricken (without calcium and phosphate) have twice this and the native Americans have four times this amount. The NATIVE AMERICAN PLIGHT CAN BE BLAMED ON THEIR POOR NUTRITION, EXCESSIVE FLUORIDATION AND FREE BUT IMPROPER DENTAL CARE. 18. IF FLUORIDATION WERE EFFECTIVE IN PREVENTING CAVITIES, NATIVE AMERICANS WOULD HAVE THE LEAST CAVITIES OF ANY GROUP. THEY HAVE HAD FORCED FLUORIDATION FOR APPROXIMATELY 62 YEARS. 19. Spokesmen for national groups are beginning to notice AN ALARMING RISE IN CAVITIES AMONG CHILDREN AND TEENS. Some dentists recommend DENTAL SEALANTS, especially for older teens not previously considered candidates for the treatment. But if sealants are now ordered, AREN'T DENTISTS ADMITTING NO CONFIDENCE IN THE ABILITY OF FLUORIDE TO PREVENT CAVITIES? 20. FLUORIDE in water at I part per million INCREASED TOOTH CAVITIES in four large reliable studies 7.22.45 and 10% (average 21 %). The reason far these increases has to do with the fact that adenosine diphosphatase is destroyed by fluoride and CALCIUM FLUORIDE which slips into the enamel, IS ALIEN TO THE TOOTH COMPOSITE AND MAKES THE ENAMEL WEAK, BRITTLE AND DISCOLORED. 21. THE HEALTH OF AMERICAN TEETH WILL INCREASE TO BE VERY NEARLY PERFECT if the regimen of WATER RINSING, SOAP BRUSHING AND TAKING CALCIUM, PHOSPHATE AND VITAMIN C IN THE DIET is implemented. 22. Fortunately, we now know the current 'teeth perfecting protocol' of dentistry with fluoridation is flawed. IF THE EARLY ESTIMATES OF 80% TOOTH IMPROVEMENT IN CHILDRENS' TEETH BY AGE 13 WERE TRUE, EACH AMERICAN WOULD NOW HAVE LESS THAN ONE CAVITY. That is far from true. The teeth in America are in a sorry state, AND AT THE PRESENT TIME ARE GETTING WORSE. 23. Numerous top scientists over the past 60 years have discarded the theory that fluoride helps teeth, or is a nutrient helpful to man. 24. TO AVOID FLUORIDE IS TO PREVENT MORE THAN 114 AILMENTS listed with references in a book Good Teeth Birth to Death by Gerard F. Judd, Ph.D.. These 114 MEDICAL SIDE EFFECTS extend all the way from cancer down to headaches CAUSED BY 1 PPM FLUORIDE IN THE WATER. Thirteen of these side effects are proved by a double blind study on 60 patients by 12 physicians, 1 pharmacist and 1 attorney. 25. The mechanism for destruction of enzymes by fluoride has been proven by x-ray studies. Hydrogen bonds are broken by fluoride. 26. Fluoride is the smallest negative particle on the face of the earth. Since the FLUORIDE PARTICLES ARE SO SMALL and so intensely negative, THEY CONNECT WITH THE HYDROGEN BONDS HOLDING THE ENZYME COILS IN PLACE and ruin every enzyme molecule at very low concentration, around 1-3 ppm. These enzymes are often 3,000 or more times the small size of the fluoride. The effect is ruinous. 27. To avoid fluoride is to prevent the destruction of 83 enzymes listed with references in Good Teeth Birth to Death, by Gerard F. Judd, Ph.D.. FLUORIDE IS A SEVERE BIOLOGICAL POISON. Being intensely negative, it unlatches positive hydrogen bonds in enzymes AND proteins. 28. It is fortunate we have learned fluoride is a nerve poison. FLUORIDE CAUSES CAVITIES. There is not the slightest doubt. 29. Methylmercury formed from amalgams in the body is deadly. It causes brain disease. Fillings made of quartzite and epoxy are a safe substitute. 30. Fluoride harms the economy by MAKING PEOPLE PURCHASE OTHER THAN CITY WATER to avoid it. It also harms the economy by making people dependent on undependable professions that know nothing about it. Ignorance about fluoride and what it does is worldwide. 31. Keep the teeth moist. Teeth that are dry 'craze' (crack). If you chew ice, teeth may crumble. Teeth do have a breaking strength. 32. LOOK IN YOUR MOUTH. Tell the dentist(s) what you want done and get several bids for examination and work. Save your fortunes. We now know we can cancel the green light given by Harry Truman with the help of Congress TO SUBSIDIZE DENTISTRY. BILLIONS OF DOLLARS BEING WASTED in this regard (Public Law 755, June 24,1948) CAN NOW BE RETURNED TO THE TAXPAYERS. I hope you will put this information in the hands of your Congress persons so they and we may alert the newspapers, radio and TV stations, magazines, and all other news media as well as their friends, families, and associates about this giant leap in dental technology. I ask for your feedback on this letter and I would also like you to ask for feedback from the ones you contact. THIS IS VERY IMPORTANT! 1. Ph.D. from Purdue University. 2. Researcher in industry: 18 yrs. 3. Prof of chemistry: 33 yrs; retired professor emeritus. 4. Fluoride laboratory studies: Linde, Purdue, Wright Field and Phoenix College, 13 yrs. 5. Author, revised: Good Teeth Birth to Death, 117 pp. July 1997. 6. Author, revised: Chemistry, Its Uses In Everyday Life, 305 pp. July 1997. 7. Author, Workbook, Self Quizzes and Laboratory Assignments for Chemistry, Its Uses In Everyday Life, July 16, 1997. 8. Author, Chemical Hygiene Plan, 89 pp., 4-23-1998. 9. Speaker, writer, radio host, bookseller, age 79, continuing as of March, 2005. 10. Fighter for truth in practical uses of chemistry. Thanks to Patricia for posting this information as a comment to a previous article. A website with more information about the work of DR. GERARD F. JUDD. Tjarko Holtjer in the Netherlands has sent this picture of his daughter's first teeth. I now place in everyone's hand the complete answer to tooth cavities. Following this procedure there will not be one more cavity, one more gingivitis case, or one more fluorosed, brittle, cracked tooth in the world. Bad teeth in Ireland, Canada, the USA, Britain, Australia and New Zealand will now be curbed. The 55-year fight with fluoride promoters (dentists) in these countries is over since research now establishes for certain that fluoride makes the teeth WORSE and not better (refs 1,2,3). My book, Good Teeth, Birth to Death lays out in no uncertain terms all the detail to achieve my claims. Doctors and public health officials did not think sodium fluoride, used commercially as a rat and bug poison, fungicide, and wood preservative, should be put in public water. The Journal of the American Dental Association said (in 1936), "Fluoride at the 1 ppm [part per million] concentration is as toxic as arsenic and lead� There is an increasing volume of evidence of the injurious effects of fluorine, especially the chronic intoxication resulting from the ingestion of minute amounts of fluorine over long periods of time." And the Journal of the American Medical Association noted (in its September 18, 1943 issue), "Fluorides are general protoplasmic poisons, changing the permeability of the cell membrane by certain enzymes." Bottled water containing between 0.6 and 1.0 mg/L total fluoride will be eligible to bear the following claim: "Drinking fluoridated water may reduce the risk of [dental caries or tooth decay]." The claim is not allowed with water intended for infants, FDA said. The American Dental Association immediately praised the agency's decision. "Whether you drink fluoridated water from the tap or buy it in a bottle, you're doing the right thing for your oral health," said ADA executive director James Bramson. "Thanks to the FDA's decision, bottlers can now claim what dentists have long known--that optimally fluoridated water helps prevent tooth decay." After 3 years of scrutinizing hundreds of studies, a National Research Council (NRC) committee "concluded that fluoride can subtly alter endocrine function, especially in the thyroid -- the gland that produces hormones regulating growth and metabolism," reports Fagin. Fagin quotes John Doull, professor emeritus of pharmacology and toxicology at the University of Kansas Medical Center, who chaired the NRC committee thusly, "The thyroid changes do worry me." Believe it or not, some doctors in Sweden recommend that the dairies start putting [fluoride] into milk because of children getting more caries - rather than deal with the real problem - eating habits and sweets! GIPPSLAND Safe Water Alliance (GSWA) members will join concerned citizens from across Victoria this weekend to develop a state-wide strategy opposing fluoridation. Alliance spokesperson Shane Elson said in response to the Bracks Government's refusal to consult with and listen to community concerns about artificial fluoridation, a state-wide, coordinated approach to the issue would be organised. Mr Elson said groups had formed across Victoria in response to the announcement in May 2005 that the government would introduce artificial fluoridation in to a number of water supplies. Groups from Ballarat, Warrnambool, Geelong, Daylesford, Wangaratta, Horsham and Wodonga will meet with Gippsland Safe Water Alliance members in Melbourne on Saturday to begin planning the state-wide campaign. The meeting of regional groups will plan strategies based on swinging or marginal seats and will target sitting Labor members in those areas. "Neither the GSWA or the regional body will endorse candidates but we will support those who oppose artificial fluoridation or will call for the full review of it," Mr Elson said. "The Queensland Government has recently backed down and put a five year moratorium on forced fluoridation because the voters in that state don't want it." Labor MLA for Morwell Brendan Jenkins said he did not feel threatened by the GSWA plan. "I'd feel threatened if the people of Gippsland didn't have the opportunity to have a fluoridated water supply, the same as people in Melbourne," Mr Jenkins said. "This is an essential public health issue that has the overwhelming support of the health profession." Mr Jenkins said the Federal Coalition was behind the supposed demise of the public dental health system. "If the group is targeting Labor it is effectively throwing its weight behind the party that dismantled the public dental health system. "For GSWA to politicise the issue and give support to the Coalition who dismantled the public system is outrageous." Mr Jenkins said the provision of fluoride in the water had, for all intents, been supported by all the political parties except for a couple of isolated calls for consultation after the deadline, including that made by Nationals MLC for Gippsland Province Peter Hall. He said claims by the GSWA that the Bracks Government had refused to consult with the community regarding fluoridation were "not fair". A number of briefings were held for people with concerns about fluoridation, he said. Meanwhile, a spokesperson for Victoria's chief health officer, Doctor Robert Hall, said the GSWA had misrepresented information supplied by Dr Hall. In an article printed in The Express on 9 February the GSWA said a letter received by the alliance from Dr Hall said an "undesirable cosmetic effect" caused by artificial fluoridation was expected. "The letter from Dr Hall referred to by the GSWA and quoted in The Express contained serious misrepresentations," the spokesperson said. "The 1998 Melbourne University study of dental fluorosis prevalence in Melbourne school children found 70 per cent of the sample were normal, 15 per cent had questionable fluorosis and 15 per cent had signs of very mild or mild fluorosis. "Further, the letter also stated that the study found that `this degree of dental fluorosis is of no public health concern and the Melbourne water fluoridation program is strongly endorsed'. "At no stage was it intimated that an `undesirable cosmetic effect' in 30 per cent of the population was expected. "Motling of teeth can be caused by a range of things, one of which is the fluoridation of drinking water supplies." The spokesperson said the Department of Human Services included a detailed section on fluorosis in the community booklet on water fluoridation distributed last year to more than 48,000 households. "It is also well known that fluorosis occurs in areas where there is no fluoride in the water, which is why we urge caution about use of fluoridated toothpaste and fluoride tablets for children. "Fluoridation of drinking water supplies has been proven to be safe and effective." If anyone's inteested, I am willing to send them my son's teeth to see if the damage was caused by flouride. I bet it was. I am using a library computer have only one hour/day. Fluoride is a deadly posion and should not be put in our drinking water. Now they try to put this deadly posion into our drinking water where i am living in Australia. It is a lot of information in your above article, i hope to be able to read it one day. It is to expensive for me to print it out. What soap to you recommend & brand to brush teeth with and what is good to neutralize acids. What can be added topically to the tooth to build the enamel? I tried a soap for a while but didn't like it, so I don't recommend. Started using sodium bicarbonate (as in baking powder) on toothbrush to brush teeth and have been happy with it. Bicarbonate does neutralize acids. Have no experience with topical application to teeth to build enamel. back enamel for my teeth. Regarding question on how to re-enamalize teeth: Dr. Gerard Judd mentioned "Monosodium Phosphate" ....which is what enamel is made of. Take 1gram per day in 1/2" of water in glass, swirl for less than a minute; add 6oz of water to it, and drink a glass each day. You can get this food-grade product from Kvet.com....it is a site for horse/pet owners. It thus comes in a huge container that lasts a lifetime....but please, don't use directions on container (its for a horse! )...you must only take 1/5 tsp (1 gram)...alternatively, Dr. Williams (naturopath, MD) suggests 300mg serving (a small capsule, in otherwords). I emptied a gelatin capsule (350mg) from another vitamin I take...and I use it to scoop up the approx. 300mg, suggested by Dr. Williams, to add to glass of water as Dr. Judd prescribes. This way I know I do not overdose! Phosphate is good, but too much creates real problems. So be careful! I like to know how much of monosodium phosphate and calcium a 9-year-old child should take. Also, if I would boil tap water, will it remove fluoride? To correct posting of Oct 6, 2006. I have brushed my teehth and gone to the dentist for 38 years and have never had a cavity. And if that Judd fellow was so smart he would know that waste left by bacteria that consume the sugar on your teeth form an ACIDIC WASTE. Which breaks down enamel over time. My 2 and 4 year old have had to have the top four front teeth caped (the dentist blamed it on my breast feeding for 22 months each)and are about to go in for five more caps on my 4 year old and 2 caps plus 3 fillings on my 2 year old. We have non floridated mountain well water, I avidly brush their teeth I limit sugary sticky food. I tried EcoDent and my current dentist said that baking soda was like useing ajax. Could it be a nutritional/ph balance problem? What am I doing wrong?! have you tried analyzing your mountain spring water? You might find a clue there. Has anyone actually had enamel re-grow by drinking the Monosodium Phosphate like it is suggested on this page? The information sounds convincing, but even a school dunce knows that acid compounds cause tooth decay. He suggests sipping milk whilst eating? I suppose he wants to tell us there is no acid in milk? This is the quackiest chemistry professor I've yet encountered. Instead of name calling, let's look at the facts of milk. An acid is a substance which dissociates to produce hydrogen ions in solution. A base (alkaline) is a substance which produces hydroxyl ions in solution. It can equally be stated that an acid is a substance which donates a proton and a base is a substance which accepts a proton. The symbol pH is used to denote acidity; it is inversely related to hydrogen ion concentration. Fresh milk has a pH of 6.7 and is therefore slightly acidic. When an acid is mixed with a base, neutralisation takes place; similarly a base will be neutralised by an acid. Buffers are defined as materials that resist a change in pH on addition of acid or alkali. Characteristically they consist of a weak acid or a weak base and its salt. Milk contains a large number of these substances and consequently behaves as a buffer solution. Fresh cows milk has a pH of between 6.7 and 6.5. To me, this means that milk, although slightly acidic, will not destroy your teeth. Indeed it will protect them by buffering any strong acid that might be introduced with other foods. From one of our Tooth Chip - soap for teeth customers. When I was small my mother was told to give me 8 drops of fluoride A DAY! because that was the protocol of the time. I have dental fluorosis as a result; my teeth are stained and spotted, they are brittle and cracked and some are broken, and they are sooooooo sensitive that I have been unable to eat most foods comfortably. Most stuff I avoided altogether. And don't get me started about the receding gums. THIS was the state of my dental health when I decided to try your chips. I don't mind telling you that I was very scared to try them. What if they made me WORSE?? After three days of using them 2 times daily I was very surprised to find myself chewing pizza, crust and all, without being delicate about it! I was shocked but I kind of chalked it up to the placebo effect. Then, I found I could have a spoonful of yummy local honey -- WITH NO PAIN!!! Imagine! I've avoided honey for years because of the pain it caused my teeth! So, it went on like this for a week, me thinking STILL that it must be a placebo thing, meanwhile I'm enjoying foods I haven't had in ages without weeping. After a week my mother said, How come your teeth look so good? They're whiter than they've ever been! So I told her about your amazing product. I'm seriously shocked, amazed, and eternally grateful that I can eat comfortably now, I can breathe through my mouth if I have to without hurting my teeth, and I can look forward to an old age with my own teeth, most likely!! You have no idea. Your gift is a Godsend to people like me. "Thank you" doesn't begin to cover it but that's all I can think to say. I am confussed, it say to drink Monosodium phosphate, then it say that harmfull if swallow??? How can I find a source for the monosodium phosphate for strengthening the teeth and gums? I have found the information here as to dose but not a source to purchase. You aren't required to take it serously. Everyone can get the information and decide for themselves. Certainly, at the end of the day, when all the data are in, we shall see what the damage from fluoridation was. Thank you so much for your FANTASTIC website. I'm so sick and tired of reading dental lies on the internet. Your site was the only one I could find that was against traditional oral care and what you said only helped confirm what I knew to be true about fluoride. My chiropractor is somewhat unorthodox and likes to overdose in natural supplements (which often is not life threatening) to see what additional benefits it can provide. He and I both use a immune booster called MMS that helps the body fight off virtually any disease you can think of. This powerful substance, taken at a whopping 15 drops per day--my chiropractor claims is so powerful that his amalgam fillings have fallen out. Your proven theory that teeth can rebuild their enamel simply when clean, combined with a way to get rid of toxic amalgam (part mercury) fillings is absolutely ideal for optimum teeth and gum care. This is incredibly interesting. I am interested in seeing before and after pictures of people who have built their enamel using these methods. Could you please post some? Thank you so much for this wonderful website and all the great information that you provide. I have been using the bar soap on my teeth for a few months now and My teeth and gums are so beautiful. I wish the world would wake up and stop using fluoride and stop lisning to all the lies that the illuminate want us to believe. Great post. Let us keep our teeth healthy and fluoride free. Had you told me this about 8 years ago i would've considered it a load of hogwash. I've always been drinking tap water and never had any major issues. Until i moved to a new suburb and newly developed area in Western Australia. Now im not perfect, sometimes i did miss a day or two, but not slowly but rather rapidly wile living in that house my teeth decayed very quickly, despite increased efforts of brushing which actually made my situation worse having my teeth crumble and break at times i brushed! I was not the only person with this issue, my sister, partner at the time, neighbors and other members of public i talked to within this suburb had experience increased problems with their teeth. Experience became that bad for me i was turned off brushing for a few weeks which actually kept my teeth from hurting during that time. Unfortunately however the damage was done. I now need 5 teeth completely ripped out, unfixable and the damage is generally unknown for these until its too late. I have already had one removed already. I lived in that house for close to two years, before moving there none of my teeth needing removing and cavities were easily fixable. I urge anyone if you notice an increase when you move to a new location like the one ive experienced to get onto the local shire and council about it. This kind of treatment is not on. If the water was free maybe but for the ridiculous price and tax we pay as citizens on water rates i consider it an assault on public health. I use fluoride toothpaste daily, as a part of my daily oral hygiene regime. I also trust my dentist and the dental hygienist at the local dental clinic that I go to. I live in Scandinavia. In Scandinavia we have no fluoride in the drinking water. I love colgate toothpaste for 3 reasons: 1. It is cheap 2. It contains soap which is etrmely effective in removing plaque from the teeth and 3. it contains a unique combination of monofluoropshospate and calcium that protects and aids in boosting tooth enamel. I have one concern. I don't use fluoride mouthwash! :-). Minnie. Too much fluoride is harmful for the tooth enamel. Yes, it is possible to use natural toothpaste. I once tried a natural toothpaste called Weleda calendula toothpaste. It had calcium carbonate as a cleaning agent and included no fluoride, sodium hydroxy or sodium larueth sulphate. It wass the natural stuff. Only use a pea size amount of this toothpaste. I don't touch a fluoride mouthwash because I know from experience that this gives me mild dental fluorosis in the enamel on my upper front teeth. I discovered it one day after rinsing with fluoride because I had drinked a lot of tea and coffee and feeled I needed a "fluoride therapy". The next day my teeth had tiny white spots. I immediately hide away the F mouthwash and now only use a mild fluoride TP and nothing else. BTW I live in Scandinavia where tap water in the cities is low in fluroide and no fluroride is added to puclic water. Some Scaninavian well water can still contain large amounts of fluoride. It is every individuals own responsibility to not over-use on fluoride in there own dental care. Talk to your dentist or hygienist and use whatever you feel comfortable with. 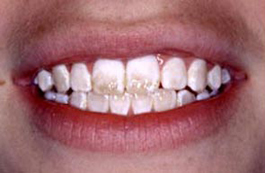 Ecessive amounts of fluoride can lead to dental fluorosis.